Although Hurricane Katrina which hit the Gulf Coast in 2005 was larger and more costly, the hurricane which hit Galveston, Texas in September of 1900 is the deadliest the US has ever seen. I’ve read three of Larson’s books, The Devil in the White City (2003), In the Garden of the Beasts (2011) and the brand new Dead Wake. This earlier book concerns Isaac Cline, the chief meteorologist in Galveston at the time, his background, his experience, the experiences of various other Galveston residents, a lot of information about weather forecasting and the nature of hurricanes as understood today. Many of the phenomenon which they saw and were able to measure then had not been seen in the lifetime of anyone alive so there was a lot of pooh-pooh’ing – barometric pressure was one of these. 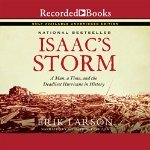 I really should have read this book before now as my late husband was a research meteorologist and my son’s name is Isaac – furthermore, I have been through a hurricane, including the eye so it’s about time I read this. It was kind of getting to be a bucket-list read. Getting to the book – it seems Cline was a child of his age with complete confidence in the ability of science to explain the world – men would shortly be able to control the weather, in fact, anything could be done through the science of the day. People and scientists had complete confidence in themselves and their work. After a moderately long, fairly interesting and appropriate introduction and buildup we get to the hurricane itself – this is the page-turning stuff. I think there may be a bit of hype on some aspects and Davidson plays those up in his reading and it makes for a very exciting listen. But Larson is the author who made the lives and ambitions of the architects behind the Chicago World’s Fair exciting. He’s is a master of writing nonfiction so it “reads like a novel” without sacrificing the factual evidence. P.S. – the audio version has a nice interview with Larson after the end. I’ve heard about this and how no one believed him and he ran around himself warning people. I can see where it would read like a novel. I’m definitely putting it on my list. Yup – that’s the guy. Fascinating book. I loved this book, but it’s so long since I read it I can only remember impressions rather than details and facts. It certainly made me think I’d happily read more of his – I didn’t read White City when BGL (I think it was?) did it. I’m rather sorry I didn’t because I probably won’t every get around to it. Larson is the only author capable of making the lives and ambitions of a couple of architects in 19th century Chicago come alive. lol – That was half of White City, the “Devil” (serial murderer) part wasn’t nearly as compelling.